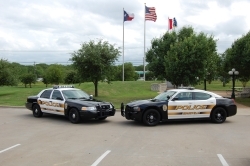 The Seagoville Police Department’s Patrol Division works 24 hours a day, 7 days a week, with the hours broken up into four 12-hour shifts. This Division is staffed with 1 Operations Commander, 14 Patrol Officers, and 4 Shift Supervisors. These Officers and Supervisors are responsible for answering calls for service, traffic enforcement, accident investigation, as well as other functions. Department has 5 Part Time Officers who supplement the Patrol Division. The Patrol Division also has Officers who are specially trained in bicycle patrol, traffic enforcement, and accident investigation. Most officers are trained in CPR and first aid. Patrol officers are an integral part in assuring the safety of our citizens during the annual parade and festivals. In addition the police department is affiliated with the Southern Regional Response Group Tactical Team. In the mix of our Patrol Division is our Crime Watch and Prevention Officer who oversees all Neighborhood Crime Watch meetings, puts on safety programs for children, and educational programs for adults such as the Citizens Police Academy.